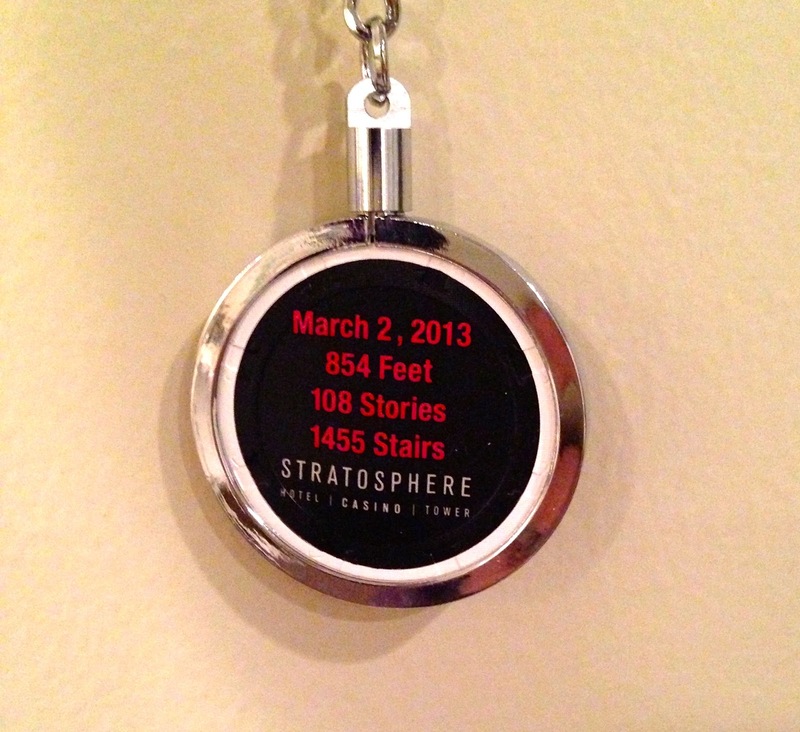 I ran in the Scale The Strat stair race on March 2, 2013. Out of the 50 tallest buildings in each US state the Stratosphere is the third tallest I will run. 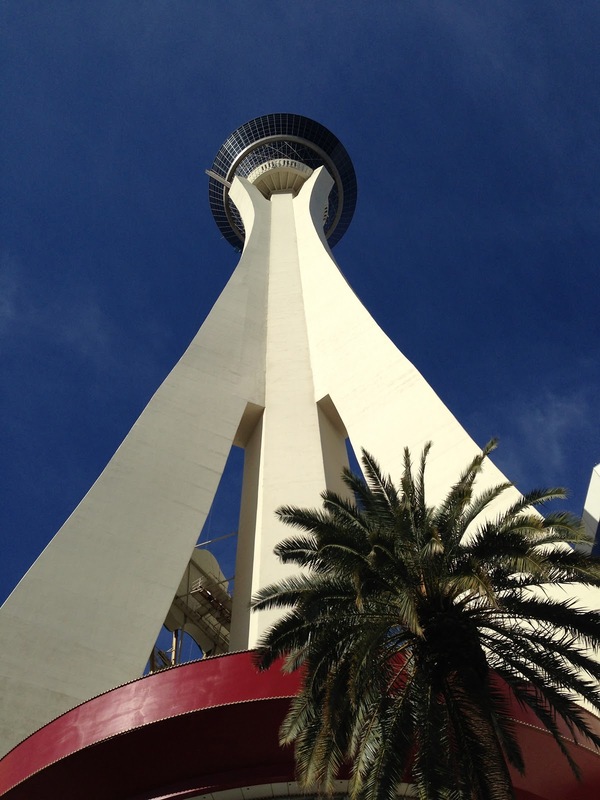 It is not technically a building but it is the tallest structure in Nevada. I have been training for only 1 month so my expectations were quite low, if I could finish between 16-20 minutes that would be a good time for me. I used this as an opportunity to leave the three kids at home and take my beautiful wife on a date by cashing in some of my frequent traveler miles on Marriott to get a nice suite at the Cosmopolitan. It was a good call. The Cosmopolitan is incredible from the large wrap around balcony overlooking the Bellagio fountains to the complimentary (for Platinum Marriott members) incredible brunch buffet at Wicked Spoon. It was wicked awesome! My starting time posted online was 10:10 am and I arrived at the Stratosphere by 9:00 am. They were running far behind so I spent some time in the VIP lounge watching the live video cameras of others climbing the tower. It was interesting seeing how fast people started the race and how slow they walked for the rest of it. I even saw one guy crawling up the stairs on all four limbs. Since I woke up at 6:00 am I began drinking water to ensure I was well hydrated on my run. Many professional Stair Racers have recommended this since the air in stairwells is typically very dry so staying hydrated keeps your muscles strong. At 11:00 am they sent me in the tower. The first six floors are not part of the race, a ALA volunteer took our group of 20 people up stairs to the staging area and start line where they stagger each participant by run by 30 seconds. There were two women behind me who thought these 6 floors were part of the race and began pushing my arm and back to get me out of the way so they could get past me. It was pretty funny. I started the race determined to keep a slow steady pace, I am still learning what exactly that pace is for me. By the time I reached the 43rd floor the fatigue kicked in. Floors 45 – 60 felt like an eternity. I paused to grab a drink and to let my heart rate go down a little then I resumed the race. From 60 – 103 I passed 12 people who were obviously exhausted. Once I hit the 103rd floor there were 5 people cheering me on as I exited a door placing me in the lowest level of the stratosphere tower. I didn’t know if this was the end of the race or where I was supposed to go. Turns out I was supposed to turn to the right, open a door and continue on. The confusing part is there were purple painted arrows on the floor that led me to the stairwell on the other side of the building. I ran up 5 floors of this stairwell and yelled “Hello!” and it was silent in there. Obviously I had made a wrong turn. I went back down the stairs and wandered around some more in the observation tower completely lost until I ran into a lady who was lost also. We went back to the original door and found the correct door to enter……very frustrating to lose 2 minutes of my time being lost since there was no one there pointing us in the right direction at that critical exchange. I was a bit upset and frustrated and that gave me adrenaline to run up the final 6 floors as fast as I could passing many people. I came to the finish line getting my picture snapped on the last stretch and finished the race in officially 15:33. It took 10 minutes sitting on a chair for my lungs to recover before I could find the elevator down. Overall it was a great experience. I was able to see many of the professional stair racers from West Coast Labels who ran seven minute times earlier in the morning. I also learned how the stair layout is which will be helpful next time I run this. 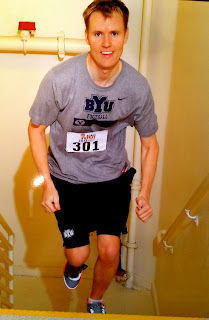 I am determined to continue training over the next year through crossfit, regular working out and weekly stair running. Other than the fatigue in my lungs my body is not sore or tired at all from this run….I did not expect this. There are many buildings in the US I will run one time to cross off my list. I don’t think the Stratosphere will be one of them. I would like to run that one again sometime in the next couple of years. This first run sets a great benchmark of where I am in the beginning of my quest. I am determined to run this race in under 10 minutes and run it with some of my family members or friends next time.